Aamer Aslam writes a detailed tactical analysis about the La Liga match that ended Sevilla 2-0 Athletic. 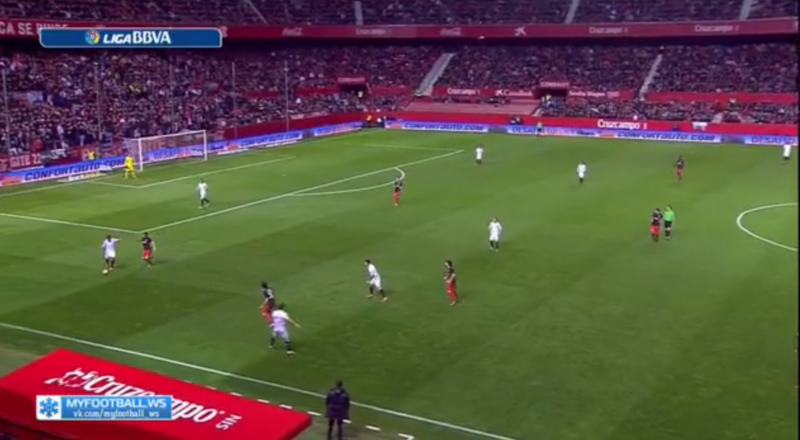 Sevilla took on an impressive Athletic side in a potential six pointer in La Liga. With just 2 points between them and fourth place up for grabs, a tense encounter awaited. Athletic came into the game on an impressive run of form having just lost 2 in the last 10 games, one of which was against current leaders Atletico. Having defeated Villarreal (currently 5 points clear in 4th place) in the Copa del Rey, facing a team like Sevilla who are considered in the same bracket as them came at the right time. The same cannot be said of Unai Emery’s Sevilla who are having an indifferent season and struggling to find any form of consistency this season. Victories against Real Madrid and Barcelona,draws against Betis and Deportivo and losses against new comers Las Palmas and relegation contenders Granada sums up their consistency. Sevilla: 1. S. Rico; 23. Coke, 6. Carrico, 5. Kolodziejczak, 2. Tremoulinas; 4. Krychowiak, 14. Cristoforo (Iborra, 88′), 20. Vitolo, 19. Banega (Konoplyanka, 70′), 7. Krohn-Dehli; 9. Gameiro (Llorente, 83′). Athletic: 1. Iraizoz; 10. Marcos, 18. Gurpegi, 4. Laporte, 18. Balenziaga; 6. Jose, 7. Benat, 15. Williams (Sabin, 85′), 22. Garcia ( Eraso, 31′), 30. Lekue (Munian, 59′); 20. Aduriz. 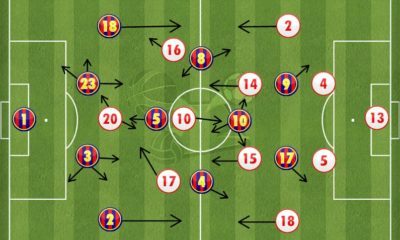 Sevilla had 3 different line ups with 3 different formations in the last three Liga games, and Emery continued the trend of not following the same line-up or formation with a return to a familiar 4-2-3-1 after failing miserably last week with a 4-4-2 against Getafe. There was no place in the starting line up for Llorente (who was in line to face his old club for the first time) as Emery went for the highly mobile and hard working Kevin Gameiro up front. Carrico returned to the starting line up in place of the suspended Adil Rami. Coke and Tremoulinas started together in the wing back positions for the first time since the first of November. Benat and Laporte were back in the line up for Bilbao after serving their suspensions. In form Aduriz led the line in a 4-2-3-1 formation with Inigo Lekue and Inaki Williams offering support on either side. 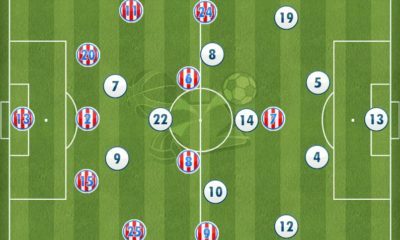 Although the official lineups showed both teams lining up in a 4-2-3-1 formation. Sevilla quickly changed their shape to a narrow 4-3-2-1 formation with Banega joining in with the two defensive minded midfielders to form a midfield trio. The move clearly highlighted the meticulous planning that had been put into place by Unai Emery particularly for this match. The salient points seemed to be: 1. Dropping a target man in Llorente for a mobile striker and 2. 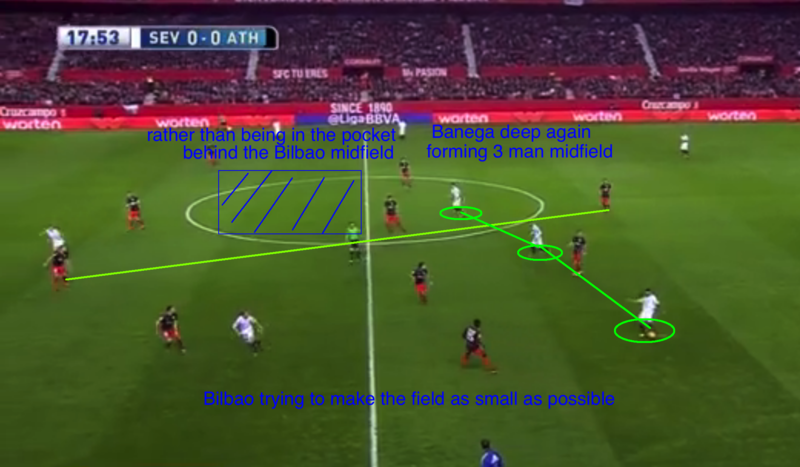 Asking the attacking midfielder Banega to drop back and quickly start attacks from deep. They were also advised to press mainly in their own half rather than the opponents. The planning and the preparation were put into test immediately after kick off as Athletic came out all guns blazing, testing Sergio Rico within the opening three minutes and hitting the crossbar four minutes later. Valverde it seemed had a plan of his own – press Sevilla high up the pitch only giving breathers to the 2 non ball playing centre backs. 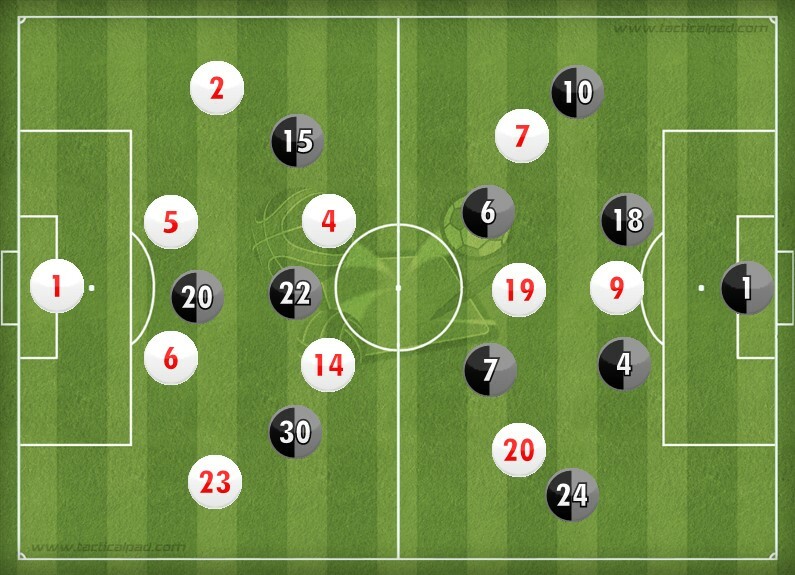 As soon as the ball moved onto any of the midfield players, the Bilbao team was asked to hunt in packs if necessary. Pressing high up the pitch was the perfect counter to Emery’s tactic of dropping Banega back. The opening 10 minutes of the match clearly showed that both coaches had done their homework. Sevilla’s tactic required a lot of running, hard work and discipline. With the ball, the 2 wingers – Vitolo and Dehli were asked to cut in almost acting as 2 support strikers behind Gameiro. Coke and Tremoulinas were tasked with stretching the pitch. Without it, Vitolo and Dehli were to make sure that they always had three in midfield. If Banega went forward, Dehli or Vitolo were supposed to occupy the space left behind in the centre reforming the trio in midfield. 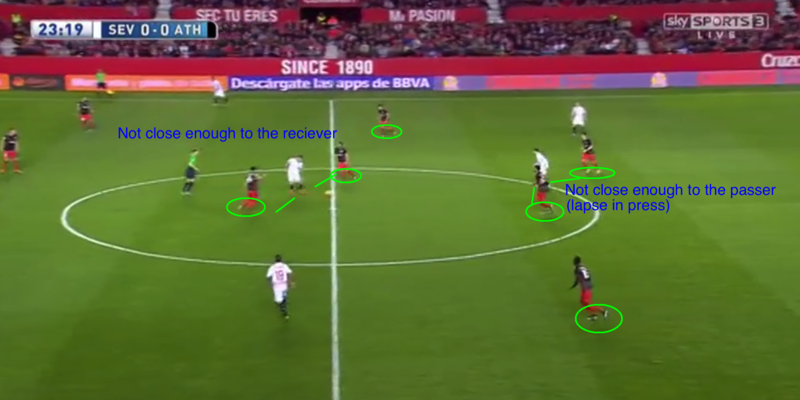 With the midfield crowded and the wing backs surging forward on occasion, the 2 Sevilla’s CDM’s were given license to move to either side of the pitch to support their wingbacks in defence thus limiting the space in which Athletic could maneuver. As Athletic put more bodies forward, a quick forward pass could open up their defence. This is an astute and commonly used tactic against high pressing teams in modern football. Athletic were clearly the more ‘attacking’ team if you will. In Benat, they had a player who is known for his attacking prowess rather than his defensive capabilities. This left Mikel San Jose to guard his back four. 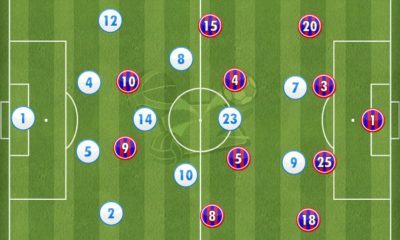 With Vitolo (more often) and Krohn-Dehli shifting in, the centre of the pitch was crowded on both sides of the centre circle. With little to chose between two robotic teams following their mangers words perfectly, it took an error or a moment of brilliance to separate the 2 teams. The goal came as a result of a combination of the two – Bilbao having 6 players high up the pitch did not press the Sevilla midfielders with the same intensity (the error) giving Cristoforo, Vitolo and Gameiro enough time exchange intricate passes before ripping through the heart of Bilbao’s entire backbone (the brilliance) to score the first goal. Bilbao had let down their guard for a moment and Sevilla took full advantage. The rest of the half passed with the same intensity and pattern. Athletic having more of the ball attempted more passes into the attacking third, a total of 65 alone in the first half whereas Sevilla only managed to conjure up 38 attempted passes into the attacking third. Sevilla started the second half with a deep defensive line and a subdued press giving Athletic more time on the ball. The subdued press meant that Sevilla had to chose precisely the right moment to hunt the ball and otherwise backed off, conserving energy. Athletic meanwhile continued with the high press. These 2 counter tactics meant that chances were at a premium in the second half. With a tense battle ongoing Krychowiak literally decided to take the matter onto his own hands (legs in this case) as he tripped over his own leg in the penalty box resulting with the ref pointing to the penalty spot rather unjustly. 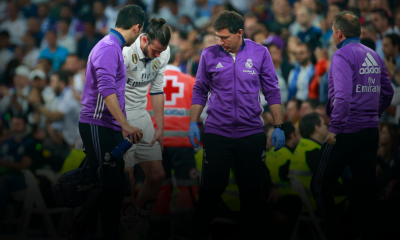 While the first goal was a big right hand to the face, the second was an unjust low blow that knocked the stuffing out of Bilbao who failed to recover. The match could be considered as a decent boxing match that involved a lot of sparring, carefully placed punches to unsettle the opponent and a couple of big right hand uppercuts, one when the referee was looking and the other when the referee turned his back. Sevilla managed to leapfrog Bilbao in the league table by following their managers advice to the last word while Bilbao were left to rue their spurned chances in the opening minutes. Football tactics and its evolution deeply interests Aamer and so does Johan Cruyff's totaalvoetbal philosophy. Jonathan Wilson is his favourite writer and Manchester United his favourite club.